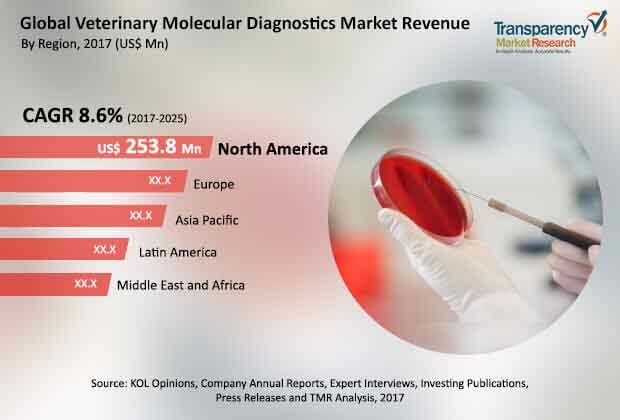 According to a new report published by Transparency Market Research (TMR) titled “Veterinary Molecular Diagnostics Market: Global Industry Analysis, Size, Share, Growth, Trends, and Forecast, 2017–2025”, the global veterinary molecular diagnostics market was valued at US$ 377.2 Mn in 2016 and is projected to expand at a CAGR of 8.6% from 2017 to 2025 to reach value of US$ 792.5 Mn by 2025. This report offers a thorough understanding of the global veterinary molecular diagnostics market including key trends, drivers, restraints, and opportunities. Rising awareness about molecular diagnostics among veterinarians and general public in both developed and developing countries is expected to drive the global veterinary molecular diagnostics market in the near future. High test sensitivity and specificity and development of new products against new diseases in animals are also driving the global veterinary molecular diagnostics market. The Asia Pacific region is witnessing gradual adoption of new technologies in veterinary molecular diagnostics, increasing animal health care expenditure, and changing dynamics of the in vitro diagnostics industry. Due to this, the veterinary molecular diagnostics market in Asia Pacific is anticipated to expand at a CAGR of 9.2% from 2017 to 2025. The global veterinary molecular diagnostics market has been witnessing a significant shift from manual systems toward automated systems. Incidence of new diseases such as helminth parasitic diseases and protozoal parasitic diseases is rising. Development of better methods such as molecular diagnostics to detect and fight these diseases promptly is expected to drive the global veterinary molecular diagnostics market in the next few years. Factors indicating the growing importance of livestock diagnostics, medicines, and vaccines such as surging demand for improved nutrition (particularly, animal protein), limited natural resources, and widened focus on food safety are anticipated to boost the veterinary molecular diagnostics market during the forecast period. Veterinary molecular diagnostics offers several advantages over the conventional diagnostic techniques such as rapid turnaround time (2.5–3 hours), high test sensitivity and specificity, and better differentiation between avirulant and birulent strains. These added advantages are anticipated to drive the global veterinary molecular diagnostics market during the forecast period. Technological advancements in devices and reagents available for veterinary molecular diagnostics have enabled veterinarians to provide proper emergency assistance to patients. Improvement in the health care infrastructure, government campaigns, and increase in per capita income have raised awareness regarding the importance of preventive care and sophisticated diagnostic tools among veterinarians and general public. Pet owners are becoming more conscious about proper and timely diagnosis of disease suffered by their pets. This rise in awareness among the people in both developed and developing countries is expected to drive the global veterinary molecular diagnostics market in the next few years. Sophisticated molecular diagnostic instruments and assays are well-recognized and validated for proper testing. However, high costs associated with these systems and assays presents a significant challenge for the market. The global veterinary molecular diagnostics market has been segmented based on product, technology, animal type, disease indication, end-user, and geography. Based on product, the global veterinary molecular diagnostics market has been segmented into instruments & software, kits & reagents, and services. The kits & reagents segment is expected to dominate the global veterinary molecular diagnostics market during the forecast period. This is attributable to the rising number of customized kits and reagents used in disease detection and health surveillance processes. Growing inclination toward preventive animal care and diagnosis is leading to high-volume processing, which augments the demand for high-throughput instruments and software. Based on technology, the market has been segmented into polymerase chain reaction (PCR), microarrays, and DNA sequencing. The polymerase chain reaction (PCR) segment is anticipated to remain highly lucrative during the forecast period, owing to several advantages over the conventional detection methods; for example, quick and accurate results. In terms of animal type, the market has been segregated into companion animals and livestock animals. Based on disease indication, the market has been segmented into vector-borne diseases, respiratory pathogens detection, diarrhea pathogens detection, and others. Based on end-user, the market has been segmented into hospitals/clinics and reference laboratories. Major companies competing in the global veterinary molecular diagnostics market and profiled in the report are IDEXX Laboratories, Inc., VCA, Inc., Thermo Fisher Scientific, Inc., Novacyt Group, QIAGEN N.V., Biomedica Medizinprodukte GmbH & Co KG, HealthGene Corporation, and Bioneer. IDEXX Laboratories dominates the market due to high market penetration of its flagship products in the global veterinary molecular diagnostics market.